Save The Whales In Praise Of Big And SlowLet's say for a minute that you are looking for a car. Something classic, yet practical. A car that will be reasonably reliable, yet exude style and presence. Something European. Now how many of you, blinded by dreams of the wind in your hair while you carve through twisting canyons, have already jumped to the sports car conclusion? While the experience of a sports car on the perfect day and the perfect road approaches nirvana, the reality is that most of us do most of our day-to-day driving on days and on roads that are anything but perfect. Potholes, congested freeways, gasoline prices over $2 per gallon, noise, construction zones and long waits at the drive-through all conspire to marginalize even the most sublime sports car. The Unexpected ChoiceIf modern transportation woes have got you down, there is a choice of vehicle that flies in the face of current accepted automotive wisdom. One that steps you back in time 25 years, when today's transportation problems were just in their infancy. Consider for a moment a five-passenger car that weighs 3, 300 pounds. A whale of a car with a five-cylinder engine that struggled to produce 83 horsepower at 4200 rpm. A car whose development could trace its heritage back more than seventy years. A car whose skinny 175SR14 radials would howl in protest when pressed into a corner. A car that today is dirt cheap to buy and, by virtue of its legendary reliability, is even cheaper than dirt to operate. That car is the Mercedes-Benz 300D diesel, built between 1975 and 1985. Daimler Diesel HistoryMercedes-Benz was the first company to offer a diesel-powered passenger car with the four-cylinder 260D model in 1935. Popular as taxis, these 45-horsepower cars had a top speed of between 55 and 60 mph and would return better than 20 miles per gallon of diesel fuel. During the 1950s, Mercedes-Benz introduced diesel engines in the 180D and 190D models, establishing a loyal following of oil-burner fans. The oil embargo and gasoline crisis of the early 1970s gave diesels a tremendous boost and Mercedes-Benz rode the wave with several diesel models. These included the W123 chassis 240D sedan, 300D sedans and 300TD wagons, the 300TD and 300TDT turbodiesel sedans and wagons, an S-Class based 300SD turbodiesel, and even a 300CD luxury coupe based on the 280CE gasoline engine car. Diesels became so popular that in 1982 79% of Mercedes-Benz cars sold in North America were diesels. Why Would You Want One?Okay, first thing is, these cars are slow. Pathetically, desperately, even disparagingly slow. Figure a non-turbocharged 300D sedan is going to take 21 seconds or more to reach 60 mph and have a top speed of around 90 mph. Yes, 21 seconds. As in twice as long as what a slow car today might take. The turbocharged version could cut that time to just 14 seconds with a top speed of over 100 mph, but that's still not going to keep up with modern traffic. Even the 300SD, with its 148-hp turbo motor could only reach 60 mph in 13 seconds, although a top speed of 120 mph was attainable. So, streaking from traffic lights was not in the realm of possibility for these big and heavy sedans. What they did do well, however, was cruise down the highway. Delivering upwards of 30 miles per gallon and coddling their occupants with real wood, leather (or the excellent MBTex upholstery), and tasteful chrome accents, the big sedans from Mercedes-Benz were a nice way to travel. Besides, looking over that long hood and through the three-pointed star on the grille is worth at least several seconds worth of acceleration on the automotive karma scale. What To Look ForThe top of the spectrum for the diesel cars from the '70s and early '80s has got to be the S-Class-based 300SD. The W126 chassis was used for these cars from 1981 through 1987, and a long-wheelbase version, the 300SDL, was available in 1986 and '87. These were big and complex cars that were highly popular with the owners of long-distance trucking companies, who could fill them up at their company pumps for free. The complexities of the cars can be their downfall today, since problems with electrical systems (particularly electric rear windows) and the air conditioning system can be very expensive to remedy. The engines are robust and will easily last many hundreds of thousands of miles. Much more popular, but also slower, is the 300D, which was based on the W123 chassis. These cars were made in sedan and wagon form from 1976 through 1981 with normally aspirated engines and from 1982 to 1985 with a turbocharger. The W123 has legendary reliability and odometer readings of a half-million to over a million miles are not uncommon. Like their bigger S-Class brothers, the problems aren't with the engine or basic chassis, but with the little things like window lift motors (again), air conditioning (again), vacuum lines and power door locks. 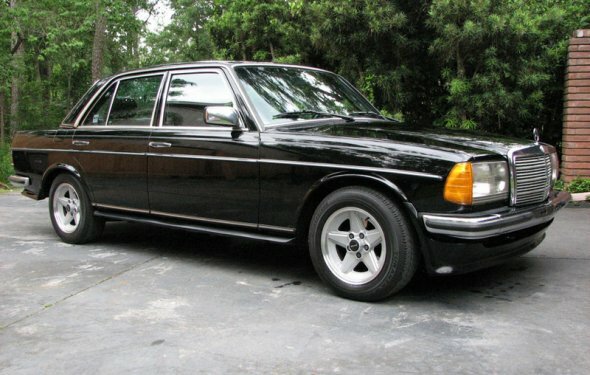 The 300D is the car everyone is thinking of when Mercedes reliability is mentioned, as these cars are the primary reason for that reputation.